Hello, lovelies~ Ever feel your eyes are just really tired after a long day staring at the computer monitor at work? I spend nearly half a day working in front of my dear computer, so my eyes are bound to get tired. 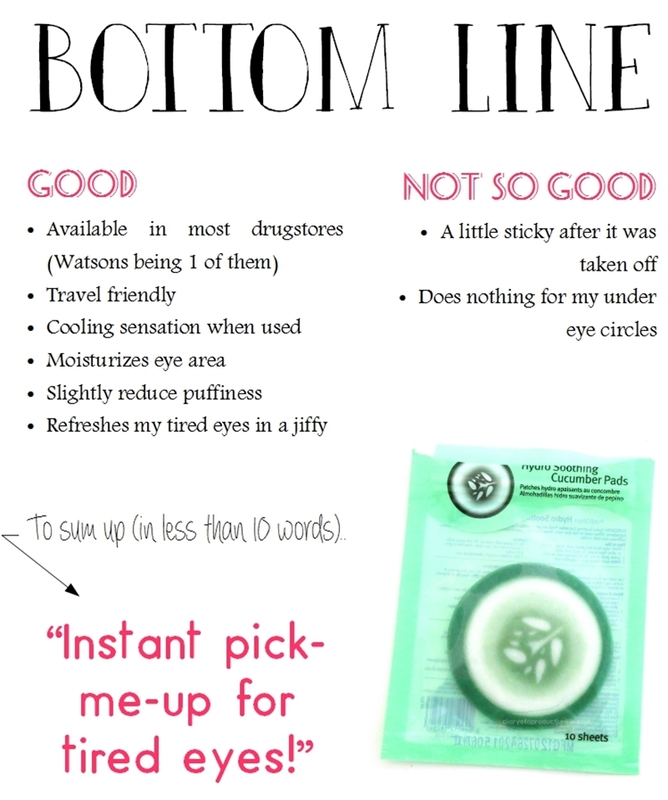 I found this eye pads from Purederm and decided to try it out. The eye pads came in a plastic zip lock packaging that can be resealable to keep the mask fresh. This helps to make storage easier as well. It contains 10 sheets of eye pads, so that's like five times usage. It doesn't contain any ethanol/alcohol or mineral oil, so that's a relief for me. The cucumber extract is place quite high on the list, being the fourth ingredient followed by portulaca extract and green tea extract. It still contains fragrance, but it is the last ingredient on the list, so I'm not too worried. The mask looks like pieces of sliced cucumbers piled on top of each other. This is quite a cute concept because it almost looks like the real cucumber slices. I don't use cucumber slices on my eyes because I am kinda worried about the pesticides that is on the surface on the raw cucumbers, lol. From the side you can see that it is similar to a sheet mask, but round in shape and smaller. The essence is a lot on each mask, but the photo below is right after I used it, so it looks dry. Using them is easy since all you have to do is to place two of the cucumber 'slices' on each eye, sit back and relax for 5-10 minutes. I usually listen to classical music while waiting for my 5 minutes because I can't open my eyes when I use this mask. It feels sooooo relaxing and soothing, my tired eyes gets relieved immediately. I don't really see this as reducing my under eye circles, but it certainly relaxes my tired eyes, giving it an instant boost. Usually after a 5 minute mask session, I feel ready to work in front of the computer again! No before after pictures because it doesn't have much of a difference. Want more Diary Of A Product Junkie goodness delivered straight to your email? Boleh dicoba tuh, gampang dan murah! Thanks for the info. Yeah, especially if you place them in the fridge before use. Brrrr.. Cool and refreshing! Purederm salah 1 brand yg undermined sih, orang jarang denger juga kyny ya.